With 2-way audio communication support, IP cameras (network cameras) can capture sounds coming from a monitored site through a built-in/external microphone and relay it back to security personnel remotely monitoring the site. The security personnel can then verbally communicate with people around the camera via attached speakers to issue instructions, warnings, etc. When cross line detection is activated, a virtual tripwire is drawn across any live IP camera feed, eliminating the cost and hassle of installing external sensors. When the line is "crossed" by a person or object, the system will trigger an alarm. Bright lighting that originates behind an object of interest will lead to underexposure for the main subject. A person standing in front of a window or entering through an outside door are common examples. When viewed using a regular camera, the person entering through the door will appear silhouetted. 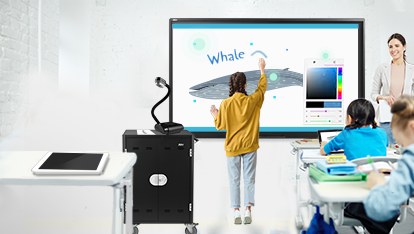 Backlight compensation technology is designed to optimize light levels to present the best image of observed objects given the lighting conditions at that moment. IP cameras (network cameras) that feature this technology will shutdown extremely high and low level light while maintaining normal lighting conditions for the objects in focus. So, through BLC, a security guard can clearly identify the object in focus even when there’s excessive light coming from behind the object. Equipped with a built-in ICR (IR-cut filter removable) and an IR illuminator, AVer IP cameras (network cameras) can deliver colorful videos during the day and black & white video when the illumination drops below a certain lux level. The IR-cut filter is a mechanical shutter placed between the camera sensor and the lens and controlled by a motor or an electromagnet. During the day, the ICR will block infrared light and allow only visible light to pass through. At night or during low-light conditions, the ICR will be mechanically removed, and the live image will become black & white, which is more sensitive to infrared light. 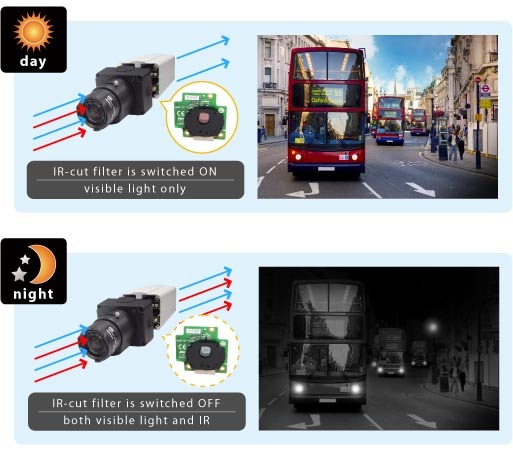 Any applications involving outdoor installations and low-light environments, such as controlling traffic and public safety, can benefit from the IR-cut filter switch feature. AVer offers multiple ICR adjustment options to fulfill different application demands: Color Mode, Light Sensor Mode, Black & White (B/W) Mode, Schedule Mode, and DI Trigger Mode. As light levels decrease, the noise level increases to compensate for lower brightness levels. 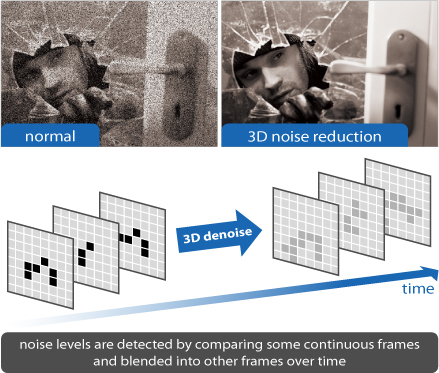 3D & 2D dynamic noise reduction is a powerful technology to provide clearer video with less noise under poor lighting conditions, making it easier to identify people or objects. Best of all, it dramatically reduces the storage capacity for backend encoding through an improved, cleaner signal. "3D (3-dimensional) denoise" and "2D (2-dimensional) denoise" are two different denoising methods. Both AVer SF2111H and SF2121H series IP cameras (network cameras) come with the 2D and 3D denoise features, while the SF2121H series can automatically switch between 3D and 2D denoise to optimize the live image quality under different lighting conditions. 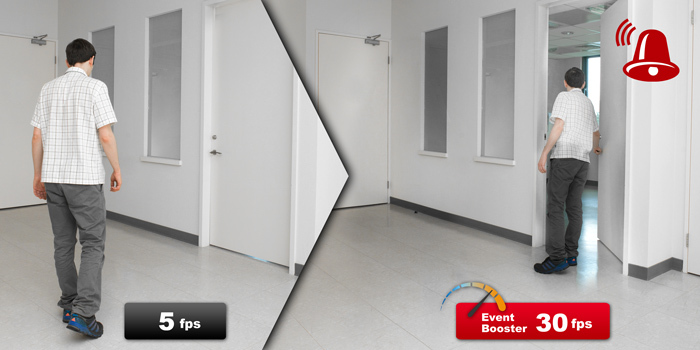 The Event Booster function is an alarm option that allows for an instant frame rate boost under specified conditions. After setting up an alarm trigger (e.g. motion detection, Digital Input etc.) the user can use the Event Booster function to ensure smooth imaging when the alarm has been triggered. In addition, the base frame rate can be reduced, saving bandwidth and storage space, ensuring that should an emergency situation arise, it will be recorded at the maxiumum frame rate available (for current resolution). 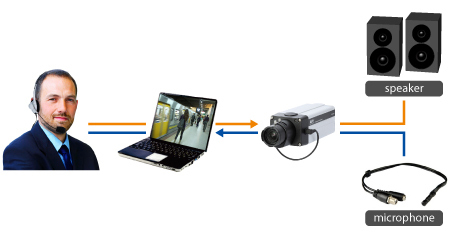 A camera installed in a corridor can be set to 5 fps for everyday monitoring purposes. If the Event Booster function is used, it can be triggered for example, by opening the restricted access doors (signal via Digital Input), notifying the operator and instantly increasing the frame rate to 30 fps. 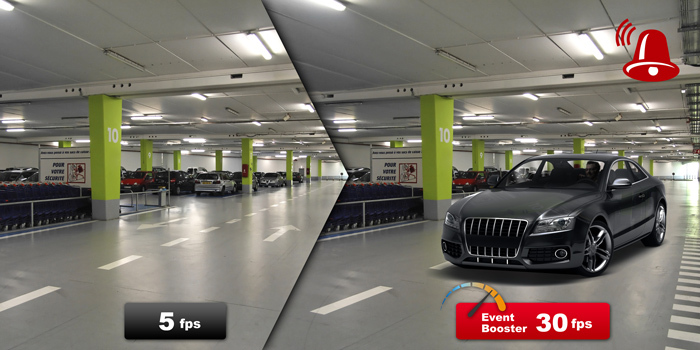 The Event Booster function can also be used with a camera installed in an underground garage. Using a frame rate of 5 fps will be sufficient to capture the scene during no activity, whereas 30 fps can be achieved by the Event Booster function triggered by motion detection in the area (e.g. car approaching). The electronic pan/tilt/zoom (ePTZ) function allows users to zoom in and focus on specific parts of a camera's live video stream without moving the camera physically. Through ePTZ, AVer IP cameras (network cameras) can support high-resolution close-up shots while allowing for greater bandwidth optimization and freeing up limited storage space. 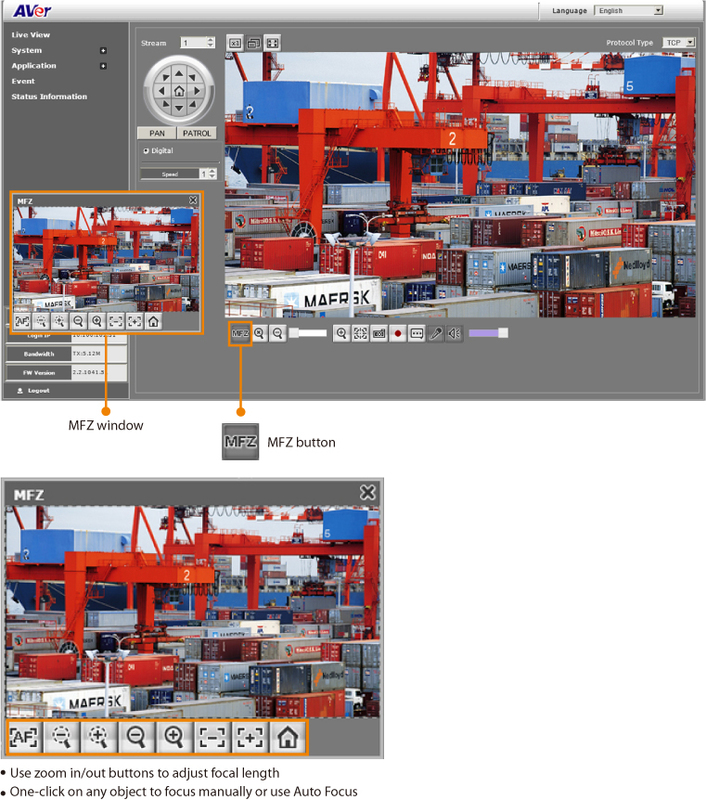 IMD is a user-defined graphic motion sensitivity feature that minimizes false alarms through higher detection efficiency. Different detection zones can be defined to enable this advanced alarm mechanism. In areas prone to vandalism, camera housing must be built especially robust, able to withstand multiple violent physical assaults. Vandal dome type cameras are a prime example of this kind of vandal-proof camera. IK ratings, based on the IEC 62262 international standard, are used to establish the level of protection of a particular camera/housing against mechanical impact. Two types of tests are employed in determining the IK rating: a drop test in which an object of certain mass is dropped directly onto the camera/housing and a strike test in which the camera/housing is hit with an object of certain mass and made of specified material. IP (or "Ingress Protection") ratings are used to define levels of effective sealing of electrical enclosures against intrusion from foreign bodies (tools, dirt, etc.) and moisture. The numbers that follow IP each have a specific meaning. The first digit indicates the level of protection that the enclosure provides against access to hazardous parts (e.g., electrical conductors, moving parts) and the ingress of solid foreign objects. The second defines the protection level of the equipment inside the enclosure against harmful ingress of water. 3 > 2.5 mm tools, thick wires, etc. 4 > 1 mm most wires, screws, etc. - IP66 enclosures are "dust tight" and protected against heavy seas or powerful jets of water. - IP68 enclosures are "dust tight" and protected against complete, continuous submersion in water. IR (infrared) illuminators take advantage of electromagnetic radiation outside the visible light spectrum, i.e. infrared waves (700-1000 nm). These devices emit high levels of IR light allowing IR-sensitive cameras to capture monochrome black & white images of scenes not visible to human eye due to lack of visible light. IR illuminators are essential for effective day / night surveillance as they allow surveillance cameras to achieve visibility in low-light and no light conditions. IR illuminator can be either a standalone device (external) or can be built inside the camera (internal). External IR illuminators have to be purchased separately and employ various illumination technologies (regular bulbs, LEDs, laser). However in most scenarios built-in IR illuminators, which typically adopt LED technology, are the best choice. Built-in IR LEDs are cost-effective and their angle is perfectly aligned with the camera lens, avoiding potential lighting issues. AVer IP cameras employ Osram IR LEDs, essentially guaranteeing excellent quality, long lifespan and energy efficiency. Built-in illuminators allow for manual adjustment of infrared light intensity, with 6 separate intensity levels available with AVer IP cameras. Users can access the camera’s UI via the web to fine-tune IR levels to fit specific location requirements, avoiding potential lighting issues, like overexposure. A built-in motorized lens allows for easy focus and zoom tuning remotely via the camera’s GUI, so focal point and focal length can be changed anytime. Users can take full advantage of vari-focal lens with stepping motor and one-click focus adjustment to set camera’s watchful eyes on the right spot. This function is especially recommended for remote, hard-to-reach locations or unsafe sites like tall buildings or utility poles. 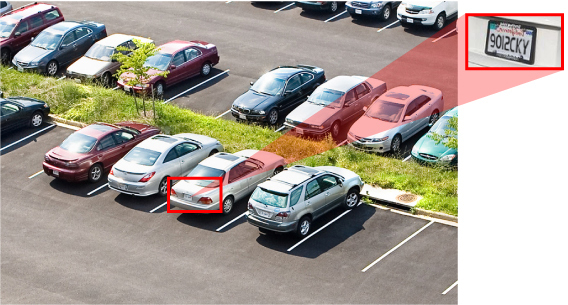 The missing object detection feature alerts users if there is a change in the scene due to a missing object. Users must first decide the period of time they wish to elapse before a missing object will trigger an alarm, greatly reducing the chances of false alarms. By incorporating IEEE 802.3af compliant PoE technology, IP cameras (network cameras) can be powered over an Ethernet cable, eliminating the need for a power cable. When you also consider the hassle of having to install power supply access points for all 16 cameras, PoE is clearly a more efficient and convenient option. Today, the majority of IP cameras (network cameras) come with PoE technology, making installation easier and more cost-effective than in the past. AVer has PoE Class 0 and Class 3 cameras. The power range for PoE Class 0 cameras is 0.44–12.94 watts. For PoE Class 3 cameras, the power range is 6.49–12.95 watts. QoS technology gives AVer’s SF2121H-R box type IP camera (network camera) the ability to prioritize critical traffic over less vital traffic, managing bandwidth resources for better network reliability. By taking advantage of QoS, users can set desired video quality levels for each service to run multiple applications smoothly on the same network. Thanks to a simple 3-step procedure, camera focus is adjusted quickly and precisely, saving time and efforts. 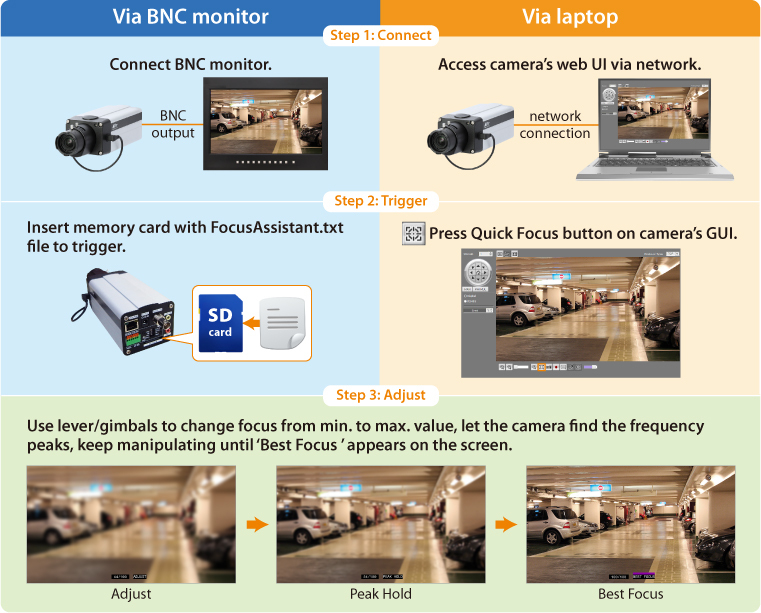 Quick Focus can be accessed via a network using web GUI or a BNC monitor connected directly to a camera. During manual adjustment, built-in focus analyzer aids installers in finding the exact moment when the image is as sharp as possible. ROI (region of interest) is an image cropping feature designed to achieve bandwidth / storage optimization through targeted image capturing. Users can select 1 or 2 key area(s) to transmit as separate streams for targeted preview and recording. A tollbooth is a commonly seen application for ROI (see image above). 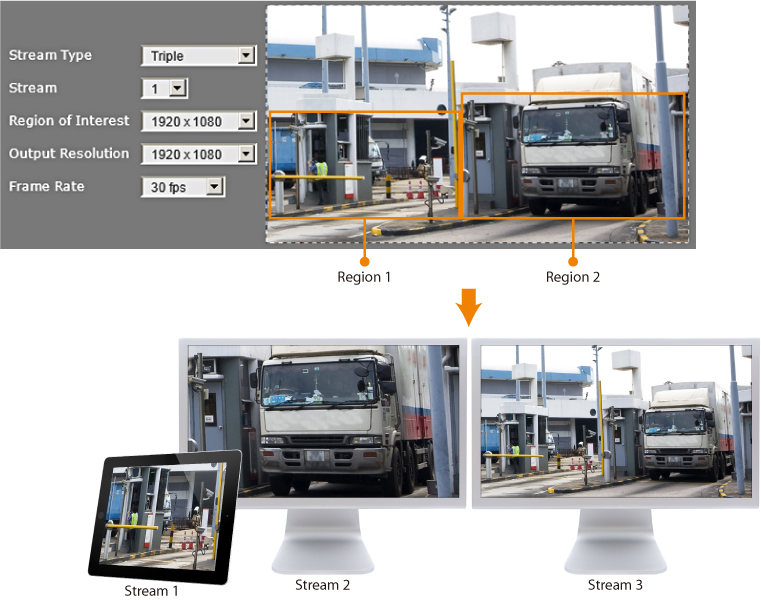 In this application, one stream is used to preview the whole area while the other two streams can be cropped using the ROI function to focus on important areas like the entrance/exit, a car’s license plate or a driver’s face. This way, important areas or details can be observed by security personnel using, for example, mobile devices while still keeping an eye on the big picture. Smart Stream is an image capturing feature designed to optimize bandwidth / storage space by increasing or decreasing quality for selected areas based upon criticality. Users can define up to 5 areas per stream (max. 3 streams) to set quality higher or lower, saving bandwidth / storage space. For example, with an overall bit rate setting of 2 Mbps (CBR), the high quality area would be transmitted at about 8 Mbps to ensure sharp images, while the non-essential areas of the image would be transmitted at about 128 Kbps (specific values can vary depending on scene complexity). Typical applications include entrances, access gates, production lines, art galleries and museums. The suspicious object detection feature alerts users if there is a change in the scene due to the appearance of suspicious object. Users must first decide the period of time they wish to elapse and the required size of the object before a suspicious object will trigger an alarm, greatly reducing the chances of false alarms. 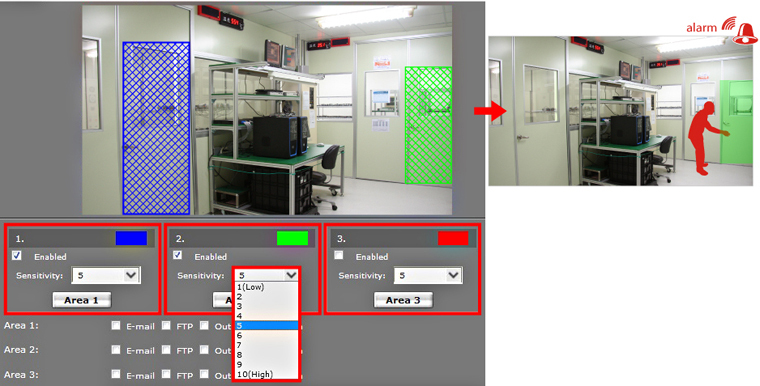 Tampering detection offers three different features to alert you if your camera is being tampered with: spray and cover, redirection and defocusing. If someone tries to tamper with the camera an alarm will be triggered, alerting security staff to the incident immediately . WDR technology maintains proper lighting contrast and ensures image clarity when experiencing severe backlight, glare, reflection and other extreme lighting conditions. AVer IP cameras (network cameras) offer different WDR levels/settings to optimize live video quality in different lighting environments. For example, a higher level of WDR represents wider dynamic range, allowing IP cameras (network cameras) to catch a greater scale of brightness. This handy feature enables the IP cameras (network cameras) to cope with any challenging lighting environment. True WDR is a sensor-based technology that achieves proper exposure levels by capturing short and long exposures and combining them into a single frame. True WDR can be adjusted using three pre-set levels (Low/Mid/High) according to the lighting conditions. Proper calibration of WDR level is essential to achieving the best result –setting the WDR level too low may not produce satisfying visibility, while setting the WDR level to high may lead to washed out images. 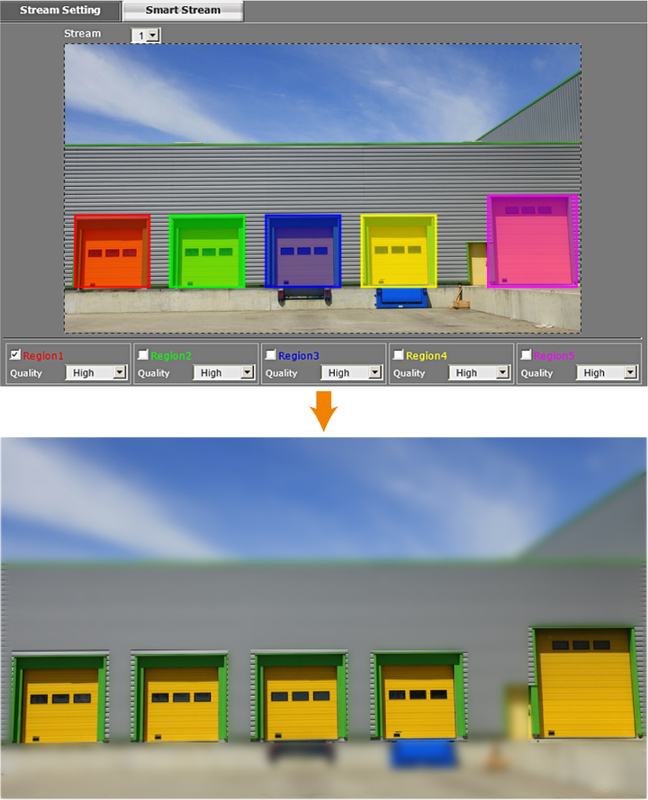 Digital WDR (D-WDR) is a software-based technique that optimizes image quality by adjusting the gamma (γ) value to enhance dark areas. The D-WDR level, which ranges from 1 to 8, should be carefully adjusted according to the lighting conditions in order to minimize possible image deterioration (i.e. the image being washed out). Both technologies are designed to solve the problem of intense backlighting but in different ways. Generally speaking, BLC adjusts the brightness of an entire image, whereas WDR independently adjusts the brightness of the darkest and brightest areas of an image. Compared with BLC, WDR is a newer technology with better performance. Please refer to the chart below for further comparison of BLC and WDR. 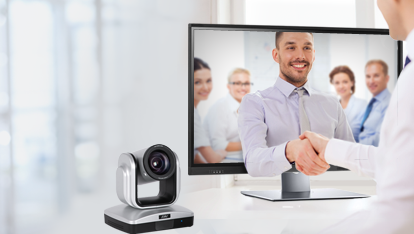 In situations where wired connections with IP cameras are difficult, expensive or simply impossible to deploy, wireless IP camera connections are the ideal choice. 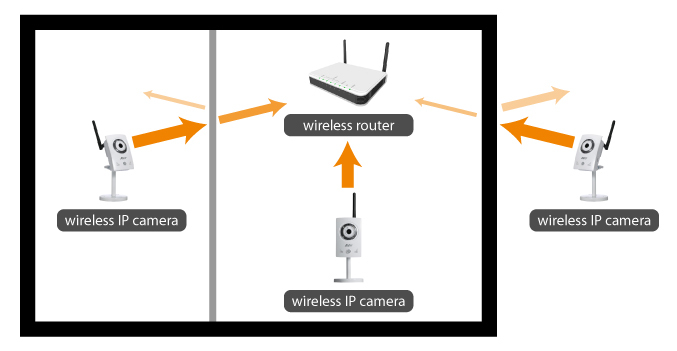 Wireless connections can be achieved one of two ways: connecting wired IP cameras to a wireless access point or using IP cameras with built-in wireless modules and antennae capable of independent wireless connections. Typically, the cube type IP cameras are equipped with wireless connectivity, e.g. AVer FC1320-PW and FC2020-PW models. Wi-Fi-enabled devices must be compatible with the 802.11 wireless connectivity standards for WLANs (Wireless Local Area Networks). As wireless technology changes rapidly, the 802.11 standard is updated regularly to include all major developments; letters are used to indicate successive standard versions. Key differences between commonly used officially released 802.11 versions (b,g,n) are summarized below. In order to ensure smooth interaction between devices on a wireless network, wireless router / access point specifications and relevant settings (e.g. mode, frequency) have to to be compatible with other wireless devices. In case of incompatibility, devices will not work together, e.g. AVer wireless IP cameras require use of 2.4GHz frequency, they will not work with a wireless router set to 5GHz mode. Speed and range of a wireless connection depend on many factors, including mainly device-specific aspects like operating mode or transmitting power. Apart from that, physical obstacles can significantly influence connection speed, quality and range. Different environments and materials can obstruct signal strength to various extents. For example, thick concrete walls reduce signal strength to a much higher degree than thin plaster walls. Also, signals are broadcasted much easier outdoors than indoors, thus the effective connection range in open spaces is significantly better than indoor environments. Furthermore, wireless devices can influence each other, decreasing wireless connection strength and quality. This problem is especially significant when devices are put together in a tight space. Also, the maximum bandwidth value listed for each mode is often unachievable in practice and should be discounted significantly to account for network overhead. Security is an important aspect of wireless networking. Wireless devices normally support multiple security standards; previously, the most common standard was WEP (Wired Equivalent Privacy). Recently, WEP has been succeeded by the more robust WPA/WPA2 encryption protocols, of which WPA2 is the newest and most secure. New protocols come in two subtypes dedicated for different users: safe and easy-to-use PSK (Personal) for home / small office users, and Enterprise (802.1X) for corporate environments. 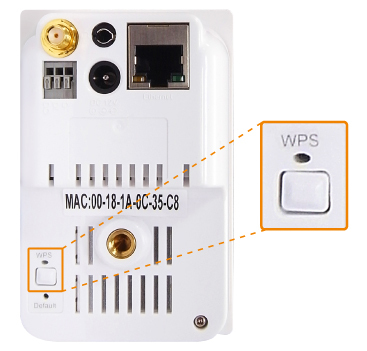 Many wireless devices dedicated for home and SMB users, including wireless IP cameras, are equipped with a WPS PBC (Wi-Fi Protected Setup Push Button Configuration) feature to simplify network security settings, especially cumbersome password input. In order to use this feature, both the device (i.e. 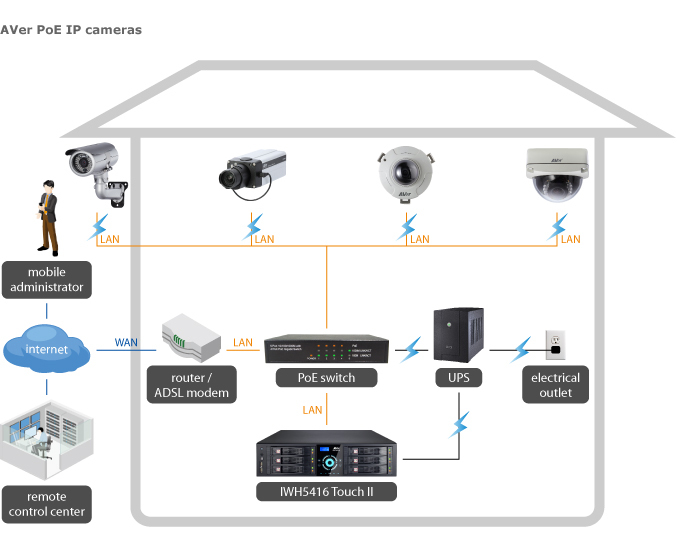 IP camera) and the local wireless router / access point need to support WPS.